Russia has resumed financing of a program to create the An-70 aircraft, according to Kyiv-based Antonov Design Bureau. "The first tranche was registered and we'll receive it on December 15. This is real money," the head of the An-70 aircraft program and deputy chief designer of Antonov Design Bureau, Mykola Vorobiev said at the Dubai Airshow 2009 on Tuesday. He said that in August 2009 at the MAKS 2009 a protocol to the agreement on the resumption of work between Russia and Ukraine on designing, production and supplies of An-70 aircraft was signed. "The document was ratified in Russia, and Russia signed an annex to the main agreement in October 2009 to pay a first tranche of RUR 150 million to finish test flights of the An-70 aircraft," he said. He said that from the start of next year the Russian budget foresees RUR 500 million to finish tests of the An-70. "We hope that we'll fruitfully cooperate on the project with Russia. At present, we have two customers: the Ukrainian Defense Ministry and Russian Defense Ministry," he said. 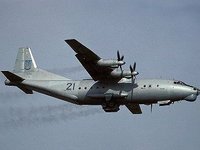 Vorobiev said that the An-70 is of great demand on the international market. "The aircraft was interesting due to large problems linked to the creation of the A-400M European transport aircraft," he said. He said that German Air Forces, in particular, had shown interest in the aircraft. He said that the An-70 is popular in those countries that do not have many airports. The aircraft has a short take-off and landing and can land on unpaved runways, he said. Vorobiev said that potential customers of the aircraft could be Central and Southeast Asian countries, and African countries.